Paris is a universal city. If there is less in flow of tourist, still the city is busy with the local people. It is also known to be very colourful in the nights. Paris is such a place with different tourist attractions. There are lot of sightseeing, museum, adventures and churches. 1.THE MUSEUM: THE LOUVRE: It was first a Palace which is now converted into a Museum. It includes paintings done by great painters like Leonardo da vici, Monalisa etc. This place is guarded by security because of the chances of paintings being stolen. Different types of Antiquities are also displayed. LatelyThe Louvre was renovated and was named as Grand Louvre, with a beautiful Pyramid structure situated in the courtyard. 2. FALAISE D AVAL: Don’t miss out on the rock formation it is a natural arche that has taken a shape of an elephant dipping its trunk in the sea and next to it is the Aiguille at a height of 70m high white as a chalk rising from the surface of the waves. These arches are developed on its own by an underground river parallel to the coastline you can walk through the arch at low tide. The sunset view is awesome. There is a small chapel on falaise d Amont and a beautiful monument in the shape of a WISHBONE in remembrance of two Frenchaviators. 3.EIFFEL TOWER: A world architectural wonder is the EIFFEL TOWER and attracts a lot of visitors who come on official or tourist visit to Paris. It has been built by the metal expert Alexandre-Gustave Eiffel keeping in mind all the parameters of its structural strength, as well as an antenna was built for has also attracted broadcasting and helped as a radio station. This statue is also known as an iron lady. Something so beautiful is that at the beginning of every hour it sparkles for five minutes. This tower can sway 6 to 7 cm in the wind. You can even have a delicious meal at a restaurant situated on the first floor and the second floor of the tower. 4.CATACOMB TOUR: It is an adventure to experience this tour. Especially the grave of the dead and it is an underground tunnel that is situated under the city streets. The remains of the dead like the bones and the skull are stacked on each other. 5. DISNEY LAND: Disney Park is situated in Marne-la –Vallee just half an hour from Paris. The Kids will be in their glory after visiting this park. It has nearly 52 attractions. But there are also 3 fantastic parks where one will take three days to roam in these parks, they are DISNEYLAND PARK, WALT DISNEY STUDIOS PARK AND THE DISNEY VILLAGE. THE DISNEYLAND PARK IN PARIS is a place where one can meet all their favourite characters of Disney. In THE WALT DISNEY STUDIOS PARK one can enjoy the adventurous ride in the cinema, where one can watch their favourite Disney movies. 6. BATEAUX PARISIENS RIVER CRUISE: It tours the river Seine and from there one can get a wonderful glimpse of The Eiffel Tower, Notre dame cathedral and Orsay museum. Even catch the sight of house boats and floating restaurants. The boats cuts through the waters under many bridges silently, while the people eat their delicious meals, they are smartly dressed for the occasion. 7. PALACE OF VERSAILLES: This Palace was a complex that housed many government officials, mostly from the royal family, which made it very easy for the French Duke to see his officials at a short notice. It became a permanent residence for them with a population of more than 60,000 people making this one of the largest areas in France. The Palace with its artistic paintings and art work also has beautiful gardens which attracts people with its sweet aroma in the air. 8. JARDIN DU LUXEMBOURG: It is a beautiful park for children with many activities like pony ride puppet show and indoor games. There is also a rose garden, around the park there is also a palace called Palais du Luxembourg. There is a Medici fountain built in the year 1600 but was renovated in 1800. The kids also can enjoy a boat-ride in the pond. 9.NORMANDY D DAY TOUR AND BEACHES DAY TOUR: Normandy was a battlefield where many American lost their lives during the war. They were buried on that ground. The 9000 white crosses is the remembrance of the people buried. From the battlefield Omaha beach can be seen clearly. The American soldiers used to land on this beach. Normandy is famous for its Diary products. 10 PARIS COOKING CLASS: Those who want to try their hand on French menus can go for cooking classes. You will be shopping with your professional chef for the ingredients, spending time on preparing food with different techniques and not forgetting to taste cheese and wine. 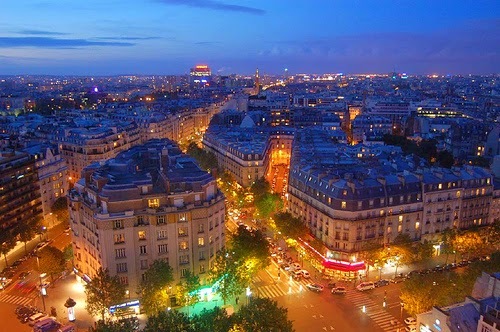 They have short terms courses where while touring one can learn the different cuisine of Paris.